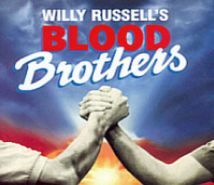 Blood Brothers tells the story of a pair of twin boys seperated at birth and both raised on different sides of the economic divide. They soon make friends and realise they have the same birthday and are very similar. The single mother and carer looking after their seperated twins both believe an old wives tale that if the pair ever find out they have been divided they will both die on that day.